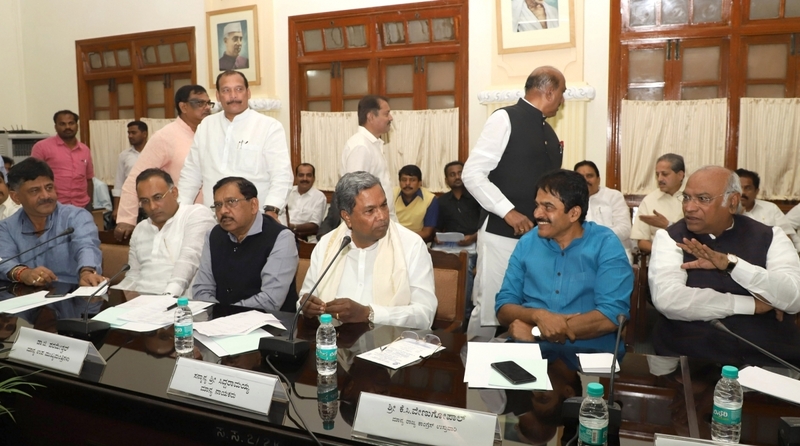 Four Congress MLAs were not present in the crucial Congress Legislature Party (CLP) meeting on Friday, 18 January, leaving former Karnataka Chief Minister Siddaramaiah livid and the party embarrassed. Soon after the meeting, the 76 of the 80 Congress MLAs who were present were packed in a bus and driven to Eagleton resort off Bengaluru-Mysuru highway in Bidadi. The Congress alleges that the BJP is trying to poach its MLAs to bring down the coalition government. Addressing media persons, CLP leader Siddaramaiah confirmed that 76 MLAs were present at the meeting today. “I will send notice to absentees and seek an explanation. Then I will speak to the high command,” the 70-year-old Siddaramaiah said. The four MLAs who were not present despite threats of disqualification were Umesh Jadhav of Chincholi Assembly segment in Kalaburagi district, Ramesh Jarkiholi from Gokak constituency in Belagavi district, B. Nagendra from Ballari segment and Mahesh Kumathalli from Athani constituency in Belagavi district. Siddaramaiah said that Umesh had sent a letter that he is unwell and could not travel, while Nagendra could not be present due to some court-related work. Accusing the Bharatiya Janata Party (BJP) of trying to destabilise the Congress-JD(S) coalition government in the state, Siddaramaiah claimed that the Congress MLAs were offered crores to jump ship. “(Prime Minister) Narendra Modi, (BJP chief) Amit Shah and central ministers are also involved in this process of destabilising our government,” Siddaramaiah alleged. “They approached our MLAs with huge offers of Rs 50-70 crores. I have proof. How come a Chowkidar has so much money?” he said. “BJP has been trying to come to power through undemocratic means and has kept its own legislators locked up in Gurugram, Haryana,” the Congress leader said. The BJP has housed over 100 of its MLAs in a five-star hotel in Gurugram near the national capital for the last four days. MLA Sowmya Reddy said that the stay in the resort will be for one day only and is aimed as a show of strength. “We are not going to leave, we are working together well, let us work. We are all going to Eagleton resort; it would be a one day stay probably, a show of strength. We will also have discussion on upcoming parliamentary elections,” she was quoted as saying by ANI. “The Bharatiya Janata Party (BJP) is indulging openly in horse-trading and is trying to bring down the (JD-S-Congress) coalition government by hook or crook,” Congress state unit president Dinesh Gundu Rao told the media here. 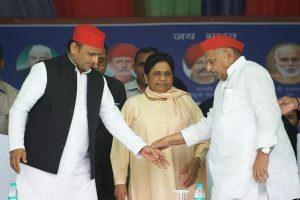 “We need to have all our MLAs in one place and deliberate with them on the upcoming Lok Sabha elections. So we are all going to the resort,” Rao said. While the Congress claims that the BJP is using ‘Operation Lotus’ to topple the government, the BJP claims that it is the Congress-JD(S) which is trying to lure the MLAs of the saffron party. BJP has also rejected allegations of attempts to destabilise the Kumaraswamy government.